Hype is terrific, but this will be one of the first articles you read about poor iPhone 5 sales compared to expectations and sinking Apple stock. Unlike the tech rag writers, I have no advertising motivation to push the current incumbent Apple or derive any revenue from Android, Windows Phone, or even the beleaguered Blackberry. Do you want to know why Apple started the campaign to not buy an iPhone at the beginning of August? It was to hedge their bets while trying to look like the good guys, before the iPhone 5 launch. Let’s face it. Apple doesn’t really have anywhere else to go – nothing really evolutionary and still a very high price at $699. While trying desperately to push the idea that iPhone 5 alone will save the economy, Apple had to make sure there were hundreds of articles about not buying an iPhone in search engine results, before the real complaining articles come out and it’s difficult for customers to find or see the real truth and problems. The connector is different for charging and communications. Apple can’t come up with anything compelling in new products so they will shamelessly push you into buying all new iPod and iPad and related products with new connectors. The adapter cables to connect old and new cabling with be $40 and won’t really work well. Remember the antenna problems of the last model. You better get ready to practice your Vulcan live long and prosper exercises while you use your new iPhone 5. How about the battery life? Bigger processor and more screen, there’s no way there will be another weak battery life problem. Bet you’re going to have screen tint issues just like the iPhone 4. It’s likely the slimmer and bigger screen will be even easier to break when bumped or dropped. Don’t even think about getting near liquid of any kind. Moisture sensors are still by the connector ports so the moisture from the car drink tray will still invalidate the warranty even though your iPhone 5 didn’t get wet. What’s that Siri? You’re still in beta, don’t understand women or thick accents, and pretty much still can’t get it right? That’s what I figured. Will that infamously slow camera shutter keep you from capturing that important moment? That tin sound on a loud-speaker probably won’t change how you play music. Auto-correct is still terrible and the dictionary will continue to refuse to learn new words. Get ready for another batch of really cheesy stock ring tones. Mail will still likely get archived instead of deleted. You won’t be able to reliably and effectively schedule meetings or know that you have all of your corporate mail for Exchange, because Apple insists on using their buggy ActiveSync from 2007. Google is a hated competitor so instead of Google Maps, you’ll get the inordinately inaccurate Apple Maps to nowhere near your destination. Most of those billions of paid apps are still horrifically bad. Your iPhone 5 will still operate slowly, especially when compared to Android or Windows Phone. iTunes randomly wipes all your data like before when you try to do an update. iCloud sync will reliably remove all of your Outlook contacts. iPhone 6 will be out next year and have the 5 things Apple already had developed and know people want but of course aren’t features of iPhone 5. Everyone I’ve ever known that has an iPhone gripes about some of the above complaints. However, Apple must have a zombie mode and is secretly the Umbrella Corporation, because the same people are brain-washed and pre-programmed to gush “I just love it” when someone asks about the shiny white device. 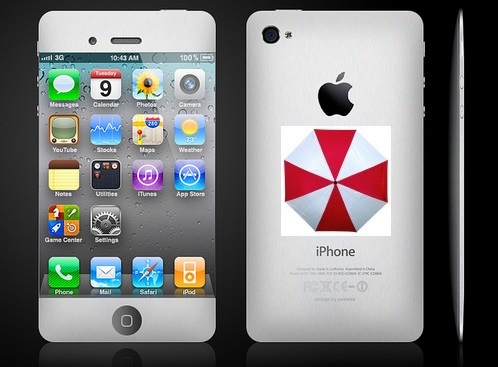 Just imagine a pristine white iPhone with the Umbrella Corporation logo from the Resident Evil saga – scary right? Thank you and I’m still your Virtual CIO. God bless you Jerry Maguire. Only on Galaxy s2 but I will be happy with that over an iPhone!